Created by Charly Molinelli of Molinelli Designs, the totaled Ferrari was shaped so that it could fit inside the interior of a coffee table. 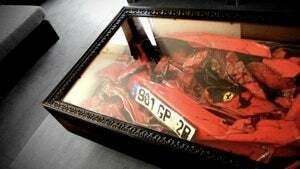 I don't think it gets more stupidly swaggerific than having a red Ferrari as the centerpiece of your living room. What's the story behind it! How much does it cost to get one done up, like this? Oh to be rich and foolish and rich and rich and rich.